For over a thousand years, the area has been a popular tourist destination and an inspiration for poets and painters. Its skyscraping cone-shaped peaks "sprout" out of the ground and are lushly blanketed with verdant subtropical vegetation. These peaks along with rivers and rice paddies are marvelously photogenic. Pedal through the enchanting back roads. There are many trails. 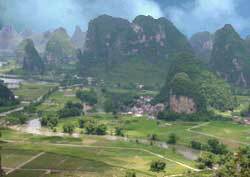 The best known one ascends Moon Hill, Yangshou's most famous site, which is situated just south of the town. Nature cut a gargantuan round hole near the top of Moon Hill (it's really a mountain peak). Moon Hill offers a stunning vantage point overlooking the countryside (see photo). Scale limestone peaks (this sport is becoming an increasingly popular pastime). Kayak, canoe or bamboo raft on the beautiful Yulong River. If you are staying in Yangshou, take a morning shuttle bus north to Guilin (one hour), then the the Li River Cruise downstream (4 to 5 hours) back to Yangshou.